Second bad experience with cheap mobile providers. I switched to Coop mostly for free calls with my husband who is also on the Salt network. It was a mess. Coop themselves told me that Salt give them terrible service. My first request didn't go through, they told me to cancel my other service too early so I ended up without any phone at all while I had visitors. No one at Interdiscount or Coop had a clue what was going on. Eventually I got my SIM "activated" as confirmed by SMS using that work, but I found that I had to top up way before I expected. I rang and found out that: 1, they can't, and have absolutely no interest in giving you information about your calls and SMS and how they have used your pre-paid amount. 2: although they sms that your account is "activated" they don't actually give you the 500MG first month free data. That, they don't tell you, is a separate activation process. The customer service person all but refused to tell me what was going on. Because I hadn't done a separate activation that no one told me about, from the beginning I was paying for data. He told me he couldn't add up all the usage, then suddenly he could, but the amount didn't make sense etc. A service that cannot tell you your phone usage is useless. Coop seems to be held hostage to Salt, who care not at all for Coop customers and told me so when I asked them directly in a store. I am now, I hope finally, with Aldi Switzerland having had nothing but good service from them for the rest of Europe. Their customer service people are fantastic and it appears, although I have not go that far yet, that I can access all my account information online, which I consider normal service. And I have received CHF60 in sign on bonuses which makes up for the waste of time and money with Coop! I am also having bad time with CoopMobile since I switched from Yallo on July. First it didn't work abroad, even though roaming is enabled. Anyway, then there are other problems each time I have to call them. Today I paid for internet twice and I still don't have connection. Their phone line is busy and just keeps me waiting forever. Bad experience, not recommended. Quite the opposite experience .. I switched the wife to coop mobile from Lyca and the number transfer was smooth, exactly as stated, within around 5-6 days. In fact she was out of the country when the transfer happened, received the god bye SMS from Lyca, changed the SIM over in the UK, coop / Salt just worked immediately and she's been using it just fine in the UK for the past week. Haven't yet tried any of the online stuff since it's only been 10 days but so far, so good. Yet another joke from Coop Mobile. My monthly internet subscription ended yesterday and I was offered to buy internet for a lot more expensive (in the photo attached). I called them and asked what changed and why I don't see the options as before. 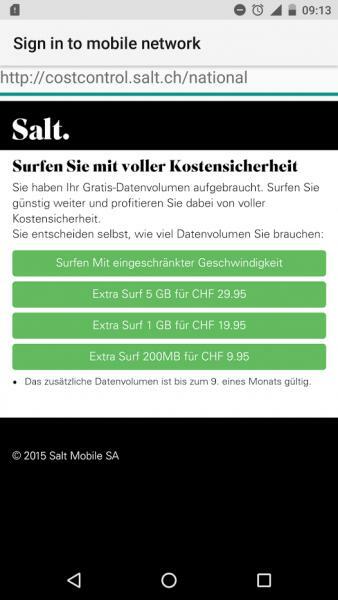 They said, I can buy again at 500MB/5CHF only after I buy 1GB for 20 CHF. I asked where this is written. They said, it is not written anywhere. Edit: I guess it was a bug because it seems to be fixed now. I wanted to ask if anyone experience problems with connection when using Coop Mobile or any other mobile operator using Salt network. Before I changed to Coop I was using Yallo and then OK.-, both of them use the network from Sunrise and the connection was perfect. I had phone connection and 4G internet (sometimes 3G) everywhere inside or outside the buildings, in train, even in tunnels. Since I change to Coop (Salt) last autumn my phone connection is very poor. It works more or less good in Zurich, but in Thalwil it's a disaster. The connection at home is weak and covers only half of the lower floor, and in the center of Thalwil near or in Coop or Migros it doesn't work at all, showing No connection or "Emergency Calls Only" (which I've never seen before while using Sunrise). There is also no or very poor connection in the train between Zurich and Thalwil. I miss the phone calls often even if I am at home. I wonder if any other Salt users experienced that? Is something wrong with my smartphone (which is actually quite old, but worked perfectly with Sunrise SIM) or is a connection in Salt network really that bad? I have used salt/orange for years and I am very pleased with their service. I have never had a problem and with my Europe+ contract for 69 CHF I am very happy with my 1gb roaming in the rest of Europe contract. I have always disliked Swisscom which seems only do well because of the swiss name and because it was once better. It is very expensive. I am also in Thalwil and don't remember seeing "Emergency only". But I actually never get phone calls so I don't know how accurate my answer is. And I am switching back to Yallo soon because I had so many problems about internet subscription/connection with Coop Mobile. I'm considering this option as well. Does anyone know if you have to buy a new SIM card if you switch back to one of your previous mobile operators or you can simply transfer your number back to the old SIM card? For transfers, you need a new sim card afaik. But don't do it online if it's yallo. I did recently and they couldn't transfer. So I went to a yallo shop (sunrise or swisscom?) or mobilezone shop. Does anyone have Salt prepaid? Coop has now fully offloaded their customers to Salt but I can't seem to top-up online. When I click on recharge it asks for payment method and then nothing else happens. Has anyone come across this before I head out in the cold to find my nearest Salt store? Huh? Coop Mobile has pretty much dumped Salt and gone back to Swisscom. Maybe the Salt thing only applies to pre-paid. yes but previous Coop/Salt customers now find themselves on a Salt product. If they/I want to stay under the Coop name they need to switch to Coop on Swisscom, get a new SIM card etc. So? Easilly done online or by popping into an Interdiscount, Fust, etc, iirc. Husband did his the other day. IDGAF Does he know how how what the problem is with topping up a Salt account online? He's not pre-paid, on monthly contract. I am not sure, but I *think* if you were Coop Mobile/Salt, you also have to make it clear that you want to remain with Salt, and get set up with a new online account. 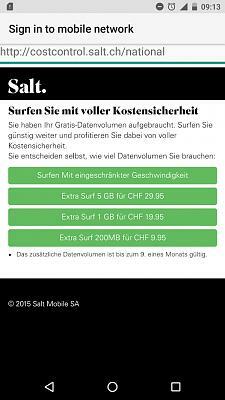 Your existing account is with Coop Mobile, which has only been using Salt, and since CM is moving to Swisscom you need to set up a Salt account. At least that's what they were yabbering on the phone to me when I was half paying attention. I can't help with your specific question, but if anyone is on Coop prepay then Salt give you a free Fr. 40 top up if you go into their shop and let them give you a new sim card. Prepay prices for calls and data stay the same as for coop, it's not a bad option for low usage/kids. As seems to happen with other Salt services, the web top-up suddenly just decided to work. I topped up 50 CHF and they doubled it as part of a promotion. Coop was using Salt and transferred all customers to Salt. If one wants to stay with Salt (on the old Coop tariff) one need not do anything. The old Coop tariff is like half of the new one or any real Salt prepay package. No wonder they want to buy the old Coop SIM cards for 40CHF credit on a new one. Actually you get Salt prepay 15 if you do the Fr. 40 swap, which is the same as the old Coop prepay rates and much better than the new Coop offer.